Book publishers are having a hard time selling ebooks. US ebook sales from the Big Five—Hachette, HarperCollins, Macmillan, Penguin Random House, and Simon & Schuster—as well as smaller publishers have fallen dramatically, to $1.37 billion in 2015 from $1.6 billion the year before. But data released yesterday (June 27) by the Association of American Publishers (AAP) shows that another book format is gaining traction. 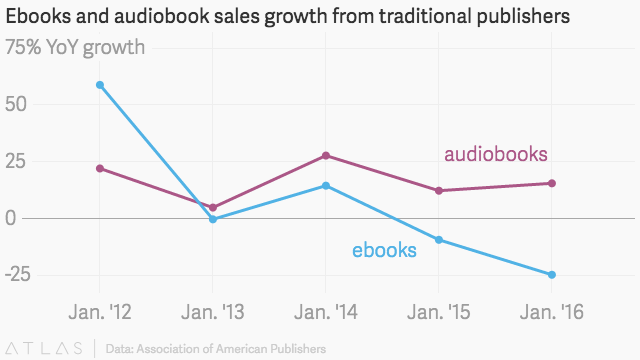 In January, US sales of audiobooks were up 30% from the same month in 2015. In the same time period, paperback sales grew 4.3% and sales of hardbacks and ebooks fell. There’s an important caveat here: Sales captured by the AAP include titles from 1,200 publishers, but don’t include self-publishing authors. In ebooks, that data can make a real difference. Still, even though audiobooks make up a small portion of total book sales, it’s clear that interest in the format is healthy and growing.